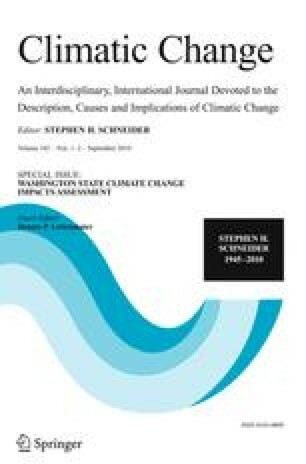 Climate change is projected to result, on average, in earlier snowmelt and reduced summer flows in the Pacific Northwest, patterns not well represented in historical observations used in water planning. We evaluate the sensitivities of water supply systems in the Puget Sound basin cities of Everett, Seattle, and Tacoma to historical and projected future streamflow variability and water demands. We simulate streamflow for the 2020s, 2040s, and 2080s using the distributed hydrology–soil–vegetation model (DHSVM), driven by downscaled ensembles of climate simulations archived from the 2007 IPCC Fourth Assessment Report. We use these streamflow predictions as inputs to reservoir system models for the three water supply systems. Over the next century, under average conditions all systems are projected to experience declines and eventual disappearance of the springtime snowmelt peak. How these shifts affect management depends on physical characteristics, operating objectives, and the adaptive capacity of each system. Without adaptations, average seasonal drawdown of reservoir storage is projected to increase in all three systems throughout the 21st century. Reliability of all systems in the absence of demand increases is robust through the 2020s however, and remains above 98% for Seattle and Everett in the 2040s and 2080s. With demand increases, however, reliability of the systems in their current configurations and with current operating policies progressively declines through the century.